Find out the latest news from the Heart of Illinois United Way, which brings together people from business, labor, government, health and human services to address community needs in Marshall, Peoria, Putnam, Stark, Tazewell and Woodford Counties in Central Illinois. The Heart of Illinois United Way 2017 Campaign Chairs, Bill and Rebecca Pape, announced Thursday, February 1 that the 2017 Campaign raised $11,108,500. Each year, more than 300 local companies and organizations participate in the annual campaign. In 2017, a $265,000 Challenge Grant, sponsored by Caterpillar Inc., CEFCU and UnityPoint Health – Methodist | Proctor, matched new or increased contributions expanding the Heart of Illinois United Way’s base of support. For this past campaign, there were 14 new corporate gifts, 20 new employee campaigns and 59 organizations increased their contributions to the United Way by 10 percent or more. In 2007, the Heart of Illinois United Way established the Philanthropists of the Year to recognize members of the Tocqueville Society who are committed to the health and well-being of central Illinois. Each year, the award honors individuals or couples for their leadership, dedication, and inspiration in creating a lasting positive impact on the quality of life in our community. 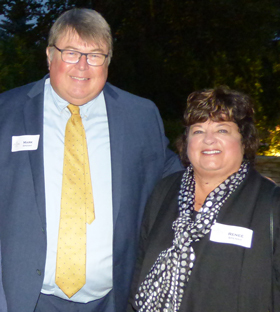 The 2017 Philanthropists of the Year award was presented to Mark and Reneé Spenny at the fall Tocqueville Society Reception. Giving back to the community is important Mark and Reneé Spenny. Together, they have given generously of their time, talents and treasure to numerous organizations in central Illinois. Since 1985, the Heart of Illinois United Way has recognized a volunteer who spends countless hours working without fanfare to help others. The annual Hoot Gibson award is presented in memory of Horace J. “Hoot” Gibson, who pursued his goals in a quiet, determined manner, caring little if others knew of his accomplishments. For her volunteer leadership in central Illinois and outstanding support for Heart of Illinois United Way, Sally Snyder was awarded the 2017 Hoot Gibson Award. Sally first became involved with the Heart of Illinois United Way as a board member in the mid-1990s and just finished another term of office. As a long-time supporter of the United Way, she’s been a member of the Success By 6 steering committee and has been instrumental in our support of early childhood education. She also serves on the health and rehabilitation allocations panel and devotes countless hours each year reviewing grants and attending agency presentations. Over the years, she has also served on our Pillars Society and Strategic Planning committees. 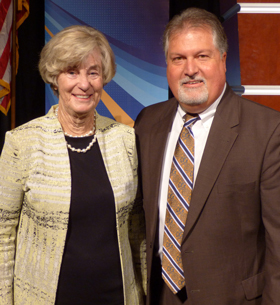 With a passion for education, Sally Snyder has spent years on the Peoria Public Schools’ board including serving as board president. In addition, she has provided volunteer leadership to numerous nonprofit organizations including the Hult Center for Healthy Living, Peoria Riverfront Museum, WTVP, Peoria Promise, Heartland Health Services and Advanced Medical Transport of Central Illinois.